Today I teach a writing class. I wake with a shiver of trepidation in my spine. Yes, I am charged by the idea of giving what I know to a group of interested students. But what overshadows that is a fear that during this all-day course, I will run out of energy. Energy has, at times, been a challenge for me. As a child I was beset with tonsillitis and never knew when it would swoop in and steal my strength for days. And later I found that when I lacked enthusiasm for anything—a job, a lunch date, a family gathering—I would feel as though my body were burdened with 400-pound barbells. Of course, I would push through, do what I had to, participate. But I usually feared that in the midst of the creation, I would suddenly run out of gas. My body would simply give up. In recent years, as my work as a travel writer took a toll on my health, the problem became serious. Now, I no longer work eight-hour days, and I marvel at people who do. So the prospect of a full day of teaching and relating appears ominous this morning. As I eat breakfast, my mouth goes dry, the blueberries sticky on my tongue. 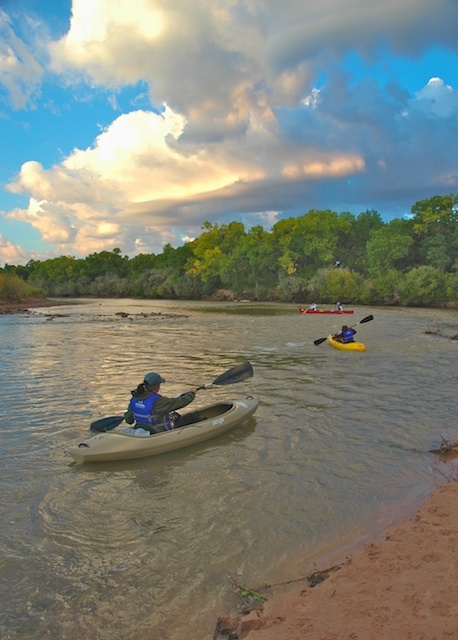 On the river, kayakers have a saying: “If you can spit, you can run it,” meaning if you can spit in a rapid, it is likely not too difficult for you. If you are so afraid that you can’t muster up saliva, you might want to portage your boat around the obstacles. This morning I can’t spit. But as I put on my best blouse and slacks, as I don my work shoes, I keep bringing my attention back to the now. I release the fear and ask the Divine for help. Just as I walk out the door, He gives it to me. Suddenly I see everything as energy: my car, the piñon trees, the blue wave of the Sandia Mountains in the distance. And, most importantly, myself. I recognize that I need not concern myself with generating energy. Instead I simply keep my attention on the now, with God, and when I do, I am all energy. Exhaustion comes when the mind is on the ascendant, thinking, calculating, stopping, starting. But when I am present in the now and holding my Beloved’s hand, all becomes quiet, smooth, lucid and flowing. The energy flows through me—so much that I have to give freely because I really have too much to contain. As I cruise on my dirt road, I watch my mind reach forward to figure out the day—and my energy drops. But the minute I bring it back and think of my Beloved, it returns. And still as I turn onto the highway, my thoughts begin to fret and plan, but I redirect them to the ribbon of pavement and blue skies before me. Each time I do, I feel the charge of the beautiful energy that I am. I am all energy, all love, a limitless flow available to take me home. Next time, though, I’ll make it a half-day course. Logan, your spirit pours forth love energy. So happy to be a receiver of it. It’s a beautiful lesson, Lesley, and one I keep trying to learn — to live and appreciate the present moment. It makes sense that to be energized is to recognize that we ARE energy and allow it to flow, rather than seek for it a piece at a time. Otherwise, I guess it’s kind of like a thirsty person drinking a glass of water one teaspoonful at a time. Where the attention goes, the energy flows — where have I heard that before? Thank you so much for this gift. As always, your writing is smooth and inviting. Thank you, Rudy. As always, you are so eloquent. And I appreciate this poetic reminder: “Where the attention goes, the energy flows.” That brings in an even deeper aspect of how important it is to create with God in the now. Ahh, the constant rememberance of choice, such a gift! Allowing atma to choose over mind/ego in every now. Soul the happy unlimited entity. Each day I wonder and examine why I allow the lesser to dominate? It is simply the strength of mind/ego that has been in charge for so long. Learning to skip the examination and just let soul choose. Each time I go with souls choice, soul gets stronger and I get happier. And yes, sometimes soul prefers more sleep, less pressure, less engagement, less sugar, more contemplation time. Your blog is a gift, thank you! I love what you say, Sheila. “Each time I go with soul’s choice, soul gets stronger and I get happier.” Boy is that the truth. It takes courage to skip the mentalism and trust in the true source, but it always pays off. I look forward to our next satsang, dear friend. Thank you, Lesley. Such a helpful viewpoint, and a reminder to stay in the now, while still listening to the body’s input about what it needs for next time. What an amazing and powerful experience, this sacred journey of soul living in a body. Your writings describe your journey so beautifully, and in a way that I, and so many others, can relate to. I always take away something I can apply to my own life. Thank you, Sage. I am so happy that we can share our writings to inspire each other. Yours do the same for me, dear friend. Thank you, John. I so appreciate hearing from you, and your sharing this with your friends. Your ocean of kisses is so welcome, as are the beautiful images you share on Facebook. Thanks for the beautiful, life affirming and energizing thoughts.! You just keep getting better and better, sweetheart. Love it. A while ago, you found a way to the unlimited energy of love, peace, and tranquility. Now, you have mastered a way to tap in to that energy while performing your routines. Soon, it will be a reflex. Automatic. Keep on growing, Lesley! Thank you, Sherida. What a lovely thing to say! You are definitely seeing yourself reflected. Blessings to you. Thank you for your kind words, Joan, and for sharing. Your beautiful viewpoint and progressive energy are always a gift to me.